17 Gorgeous Kurtas To Add Colour To Your Winter Wardrobe! Kurtas are something every desi girl loves to stock up on! 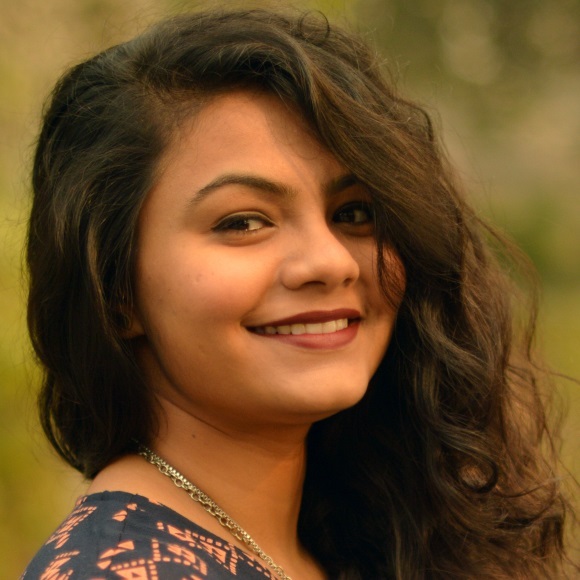 Be it summer, spring or winter, it’s an Indian wear essential that can be paired in multiple ways and looks great in every season! So with the winter months setting in and the days getting grey, here are 17 colourful kurtas to buy online to bring plenty of fun to your wardrobe. Get ready for a burst of colours! 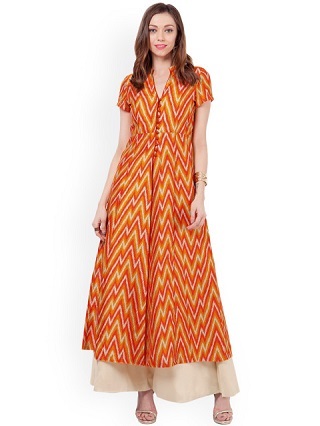 This double hued kurta is a great pick. The play of colours, the silhouette and the completely different patterned sleeves look rather amazing! The flared panels of this kurta make it a multipurpose one. 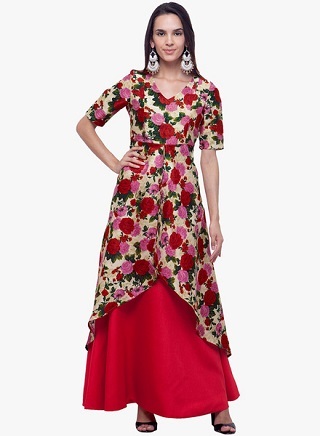 You can style it in multiple ways...from a kurta, to an anarkali to wearing it as a dress. 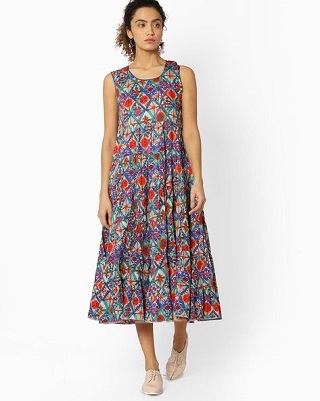 This kurta will suit all body types and we love the pretty kaleidoscope print! Price: Rs 1,899. Buy it here. Featuring a slit, a semi-button placket and a beautiful pattern of bright flowers, this kurta will make you feel fresh and alive each time you wear it! Style it with a skirt or roomy palazzo pants and chaandbaalis to look gorgeous! Price: Rs 1,400. Buy it here. 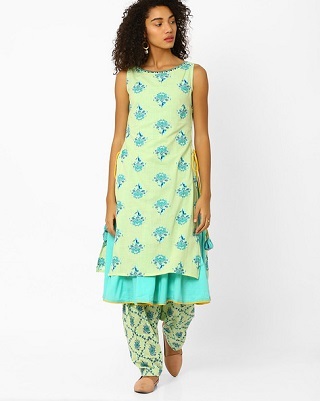 This sea green flared, pintuck kurta will set you apart each time you wear it. Give a sporty twist by pairing it with sneakers and culottes or keep the traditional vibe alive by wearing it with leggings. This is minimalism, simplicity and class all in one! Price: Rs 1,599. Buy it here. Who doesn’t like a little quirky fun in their wardrobe? We sure do! 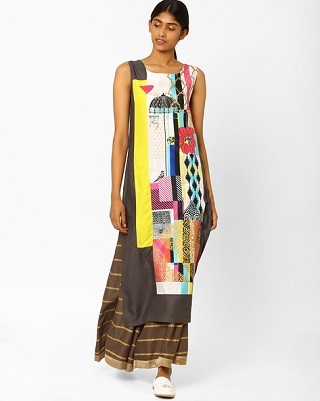 This graphic printed kurta will definitely quirk up your daily style and give it a contemporary twist. 6. Like a sketch book! 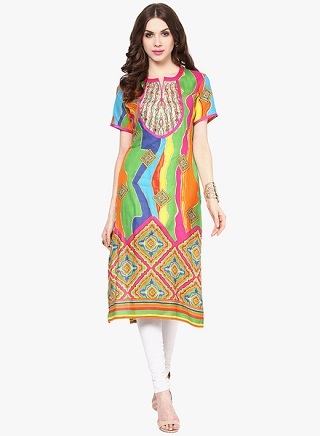 This multicoloured kurta is like a breath of fresh air for our closet. Flaunt all the colours of the rainbow with this baby that is sure to brighten a dull day. Get ready for loads of compliments coming your way! Price: Rs 798. Buy it here. Geometric prints will always stay in vogue. And an attention grabbing kurta like this one is exactly what we’re talking about. The flattering A-line cut makes it all the more worth it! Price: Rs 2,000. Buy it here. Simplicity with a little sophistication is just what you need to ace daily dressing. This calf-length kurta looks great when you pair it with jeggings, leggings or even a pretty skirt in a contrasting colour. Price: Rs 1,839. Buy it here. You can’t go wrong with a peachy kurta with a hint of gold all over. The pattern of this pretty kurta is absolutely one that you could wear to a festive occasion or mehendi and even to work! Pair it with juttis and shoulder grazing earrings! Price: Rs 1,699. Buy it here. Layering is in, and there’s no denying that this trend is here to stay. So amp up your kurta game by choosing this pretty layered two-tone kurta. The colours, the cut and the design - everything about this is just so fresh! This electric blue kurta is bright enough to help you stand out at any occasion! Pair it with high heels, a fishtail braid and some danglers to give it a pretty spin! Price: Rs 1,705. Buy it here. Candy colours are really festive and it’s just the colour pairing you need on a dull, dim day! 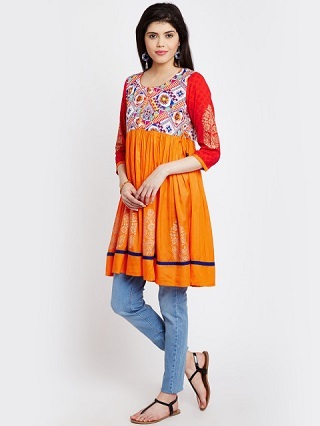 Wear this tiered kurta to look absolutely fab! Price: Rs 1,999. Buy it here. Nothing like a kurta that flaunts minty blues, lemon yellows and a dash of pink! 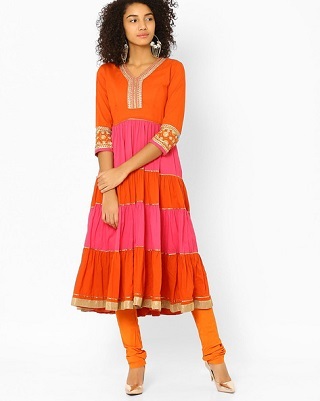 This kurta looks really pretty when paired with jeans or leggings and rather festive when paired with ethnic skirts or palazzos. Price: Rs 1,499. Buy it here. This pleated neck kurta looks really elegant and defines class without the need for any bling or shine. The Mangalgiri cotton dipped in indigo blue will drive away those Monday blues, making you feel pretty and so comfortable! Price: Rs 1,512. Buy it here. A clash of colours, print and design all fused into one kurta to make it look fancy and wonderful! This kurta can be teamed up with your regular denims and even layered with dhoti pants to make a statement! 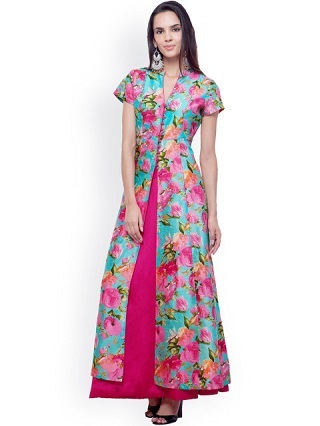 An asymmetrical kurta paired with a solid coloured skirt can make you look really amazing! It’s a break from the usual, standard designs. Try it if you wish to look edgy and pair it with your favourite high heels! Price: Rs 1,700. Buy it here. 17. Black and white pop! There’s something so beautiful about black and white, especially when combined with bright oranges and pinks! Wear this stunning kurta for a family dinner or for a special day in office! Price: Rs 1,699. Buy it here. So girls, get set shop because you deserve to look bright and beautiful!